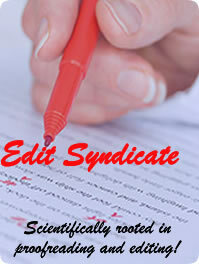 The different types of documents processed by Edit Syndicate are outlined below. The essence of this imformation is to educate prospective authors on how to develope their manuscripts. Case studies: Descriptions of a major programme intervention or policy option relevant to a particular field of study. Case study articles should include a rigorous assessment of the processes and the impact of the study, as well as recommendations for the future. Commentaries: Short, focused and opinionated articles on any subject within the a particular field of study. These articles are usually related to a contemporary issue, such as recent research findings, and may be commissioned from opinion leaders in the field. Should you have any questions about developing your manuscript, please contact us at: proofreadforme@editsyndicate.com, proofreadsyndicate@yahoo.com and proofreadsyndicate@gmail.com.